Steven Tyler is an American singer, songwriter, and multi-instrumentalist, and the frontman and lead singer of the Boston-based rock band Aerosmith, in which he also plays the harmonica, and occasional piano and percussion. Born Stephen Victor Tallarico on March 26, 1948, in Yonkers, New York. As the lead singer of Aerosmith, Steven Tyler is considered one of rock's greatest showman. The son of a music teacher, he started playing drums, but then focused on singing. After moving to Boston in the late 1960s, Tyler eventually met up the musicians that would form the rock group Aerosmith. He reportedly met up with guitarist Joe Perry and bassist Tom Hamilton while they were playing in different bands in the Sunapee, New Hampshire area. Guitarist Ray Tabano (who was later replaced by Brad Whitford) and drummer Joey Kramer joined up with the others to form Aerosmith. The band played its first gig together in 1970 and shared an apartment in Boston. In 1972, Aerosmith signed a contract with Columbia Records. The following year their self-titled debut album was released. It featured the song “Dream On,” which was a minor hit. In the early days of the group many comparisons were drawn with the Rolling Stones because their similar bluesy sound and the physical resemblance between Mick Jagger and Steven Tyler. But with their third album, Toys in the Attic (1975), the band emerged as a leading rock group in its own right. Showcasing their talent for creating hard rock, Aerosmith scored with such songs as "Sweet Emotion" and "Walk This Way." Their follow-up album Rocks (1976) also had strong sales despite the lack of a breakout single as did Draw the Line (1977). But by the end of the decade, the band was coming apart at the seams. Perry and Whitford eventually left the group while Tyler became heavily involved with drugs. Tyler kept going the group going by adding new members, but his personal problems affected his creative abilities and Aerosmith was only a shadow of its former self. By the mid-1980s, Tyler had gotten his act together after going through a rehabilitation program. The original members of Aerosmith reformed and made a remarkable comeback with 1987's Permanent Vacation, which featured the hits "Dude (Looks Like a Lady)" and "Rag Doll." The revitalized rock supergroup had more commercial success with its next effort, Pump (1989). It featured such songs as "Love in an Elevator" and "Janie's Got a Gun." With the rise of the cable music channel MTV, the band's videos helped them win over a new generation of fans. Aerosmith's winning streak continued with 1993's Get a Grip, driven in part by such singles as "Livin' on the Edge," "Cryin'," and "Crazy." By the end of 1990s, the group was unable to maintain its chart momentum with later albums. Tyler and his bandmates were still a big draw for concerts with droves of their fans turning out to see the group play live. Health problems have also cropped up for the famed performer in recent years. He underwent throat surgery in 2006 that could have ended his singing career. Fortunately the procedure was a success, but Aerosmith had to cancel half of its North American tour for that year. Also in 2006, Tyler announced that he had been treated for Hepatitis C, a liver disease. In 2008, Tyler checked into Las Encinas Hospital rehabilitation clinic in Pasadena, California, to recover from multiple leg surgeries to repair damage to his feet. Then in 2009, during an Aerosmith performance, Tyler fell off a stage in South Dakota, breaking his shoulder. The band was forced to cancel yet another tour. 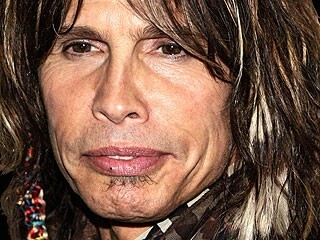 After his fall in 2009, it was reported that Tyler planned not to return to Aerosmith. A month later, Joe Perry confirmed that Tyler quit Aerosmith to pursue a solo career, but shortly after Tyler assured fans that he was not quitting the band. In 2010, the frontman headed off on the Cocked, Locked, Ready to Rock Tour with Aerosmith, performing in more than 18 countries. Despite numerous challenges in 2009 and 2010, Steven Tyler returned to the studio in 2011 with Aerosmith. His much anticipated autobiography entitled Does The Noise In My Head Bother You? is due to be released in 2011. Tyler also signed on to judge contestants on the popular reality singing competition American Idol. He joins Jennifer Lopez and Randy Jackson at the judges table on the popular series. Tyler is the father of four children. In 1976, he had a relationship with model Bebe Buell; they have a daughter, actress Liv Tyler. He was married to model Cyrinda Foxe from 1978 to 1988; they have a daughter, model Mia Tyler. He married Teresa Barrick in 1988, with whom he has two children, Chelsea and Taj Monroe. The couple separated in 2005. Tyler was then rumored to be dating model Erin Brady. View the full website biography of Steven Tyler.